Written by David Martin and translated by Romain. The primary purpose of a web API is to expose data to be consumed or changed. Fairly quickly, the question of securing access to such data presents itself. And other aspects become critical too, such as performance management API or the respect of access quotas. Since creating a Web API is now rather simple, APIs tend to proliferate. When the number of APIs becomes quite important, these requirements obviously can be considered cross-cutting needs. And therefore it is not unreasonable to suggest that they can be treated outside the API. How to implement these cross-cutting needs? A reverse proxy is a possible approach. 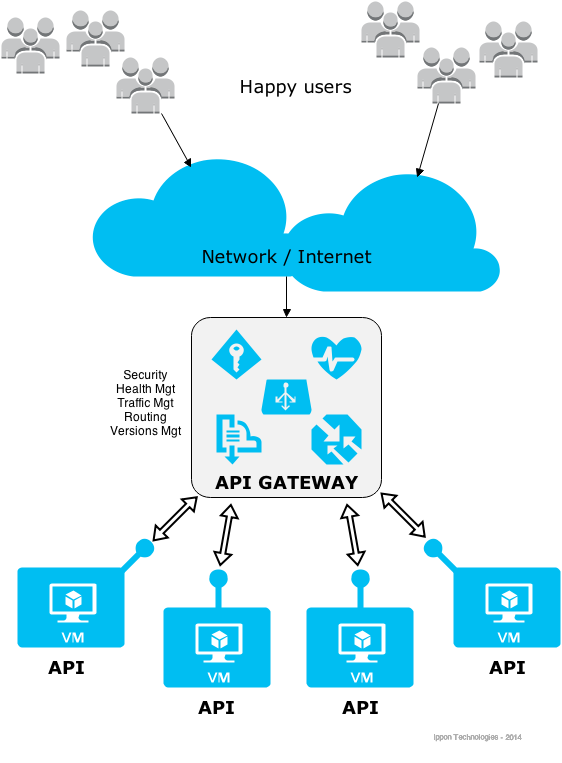 This component is commonly called an API Gateway. Is it a great idea that nobody has thought of yet? No, far from it, since many publishers now have solutions of this kind, with variable amounts of features and different maturity levels. Commercial products are now numerous and started to get acquired by large publishers cycles (example: Intel acquired Mashery in 2013, Computer Associates acquired Layer 7 in 2013) or to enter partnerships (SAP and Apigee 2014). Not all are equal, some stand out and have already gained notoriety (Layer 7 for instance, with his API guru workforce). All these solutions do not have the same traction in the world of open source and are not equal, far from it, in terms of features. To date, WSO2 API Manager is the richest in features and is well-polished. It is a good platform candidate to implement an API Gateway at a reasonable cost (cost of learning the technology and deploying it). Even though this solution is advanced, it does not necessarily cover the full spectrum of features of its commercial competitors. There is always the possibility of custom-assembling a solution when the needs do not seem to justify the adoption of a turnkey product. Several open source reverse proxy solutions can be configured to provide the basic functionality of an API Gateway. But beware the long-term costs of this approach. In conclusion, carefully analyze your needs to identify the appropriate strategy: supporting these aspects in the API itself may look like a good and cheap option, but it will lose its appeal if your API portfolio grows. Soon enough, the adoption of a specialized solution will prove to be a good investment. Whether it is open source or not, free or not, custom or off the shelf, on-premise or SaaS, and so on, will depend on many other parameters that need to be examined.